Maria Sharapova is a well-known tennis player, currently ranked No. 5 in the world. One would expect that her personality and life (as seen on her hands) would reveal not just her talent and success, but also a life which is happy and fulfilled. Well, it is not exactly like that. is good: a large hand with slightly short fingers and well developed but not excessively developed mounts. The finger phalanges are balanced as well, and combined with the texture of the palm it shows a talented, hardworking and balanced individual. A good person too. And as expected Sharapova’s thumb shape and length when combined with the straight Heart and Headlines shows a self-contained, disciplined and pragmatic person with superior willpower. Stubbornness and aggression are personality traits present in just the right amounts, enough to enhance the discipline and goal-oriented behaviour but not so much as to make her obnoxious. In fact, flexibility is one of her traits. The strong line from inside the mount of Venus, crossing and joining the Fateline shows the strong influence of home in her life, akin to restrictive circumstances. This fits in well with what is known of her childhood. She started playing tennis at a very young age, and the influence of her father was paramount. Does such a line mean that the person was coerced or pressured in some way? It can, but not always. And not in Sharapova’s case. Coercion is unlikely in Maria Sharapova’s case because coercion generally results in personality defects or some sort of psychological disturbance. Sharapova’s hands show her to be a balanced and sensible individual. There is no evidence of psychological issues. Somewhat similar markings are present on Michael Jackson’s hand as well, but his hands show signs of emotional disturbance and one can conclude (as many already have) that his childhood experiences had an adverse effect on his emotional health. However, high pressure in childhood does take its toll, even with strong internal motivation. Any dramatic influence or event can alter one's personality, especially if it happens in childhood. This, in turn, changes one's life path. Without a clear picture of Sharapova's left passive hand, it is not possible to tell how her destiny changed ...who she was meant to be and who she became. Sharapova's hands show that she became engaged with what she was doing early on - clear from a study of her Fate and Heartlines. It is possible that patriotism figured somewhere on her motivation radar, at least when she was older - if one goes by the idealism shown. Interestingly, this engagement or rather emotional fulfilment in her work started in the early teens, and is very intense in her early to mid twenties. It falters as she nears thirty. From the age of approximately 30, her life shows a change of direction from the life she led before. (Exact ages are difficult to see). Financially she is good but there is less fulfilment. However, in her early forties, things get better and she finds the peace and contentment she desires. Read Roger Federer's hand analysis and also that of other tennis players like Rafael Nadal and Venus and Serena Williams. Or what the hands of Shoaib Malik and Sania Mirza tell us about their relationship. Or check out the hand analysis of other Sports Stars from the field of Cricket and Football. I didn't know that she lives in the US. It's a long time since I watched any Tennis, but when I was doing it, she was a star player. The less fulfilment and unhappiness can be a good thing as it brings people (esp. stars) back to the earth (a bit). That's why, maybe, good and bad things (are supposed to) happen in cycles. PS: I remember your article on the other blog mentioning that noodles are bad for health. Now, Top Ramen has come out with Oats-based noodles, instead of maida-based ones. Do you think this maybe any healthier? That's a very philosophical observation, about life going about in cycles. True for most people I guess and for celebs the highs and lows would be more intense. DI, all processed food is unhealthy. I will email you an article I wrote for the New Sunday Express (delhi) about this very topic. I agree that the clear and Straight head and heart lines point to a controlled and a calm personality but the length of thumb looks average in the picture. What makes a will strong in your opinion? You have been reading hands for so long , it must be a pity to see people not bringing out the best in themselves due to a dilapidated will. Is there a way out? Unfortunately a clear pictures of her right hand which showed the length of her right thumb was not available for linking to, but the pictures of her left hand clearly show a large thumb. I have studied at least 5-6. In any case even in the picture of her right hand, (one which I linked to) the thumb is not average. It is difficult to estimate the length in the picture but one can certainly say that it is a good length. Also, please note the strength of the first phalange. As to the question as to what shows a person's strong will, one has to look at the whole hand. The hand has to be at least an average size, with an above average thumb and a good first phalange of the thumb and a good headline. Also one has to check how volatile the person is because the baser his/her instincts, the stronger the emotions, the more heightened the nerves, the stronger the will needed to keep the personality in control. So it has to be a judgment. And yes will power can be developed. But one has to see the cause of the lack of will power. Is it inherited? Is it developed? And one has to also see whether the person has a balanced personality, at least average intelligence...and so on. No single quality can be considered the most important. Dear Nitaji , Can you shed some light on increase of will power? How can someone improve one's inherited will power? Are there any specific instances of such extraordinary changes? Of course there are many instances. No personality characteristic is fixed and permanent, surely that is a given. If you are asking how to change a personality characteristic its very simple and clear - you need motivation. And any changes in personality like getting rid of temper, improving will power etc are not as extraordinary as you think. It is in fact fairly common. The reverse is also common. People change, either for the worse, or for the better. It depends on their inner motivation, their circumstances, the people they are with, their values and so on. Came back to you blog after a long time and it's still the same interesting, involving and detailed. Get to learn a lot about the world star personas. I read in this post that a line form Venus joined her fate line resulting in restrictions in childhood or too much of family hindrances. What happens when there is also a line joining form mount of moon, as most of the book says its an influence line related to affair that may turn in marriage. Biplab, the line you mentioned, an influence line from the Mount of Moon is exactly that - an influence line. And it not related to the line from Venus or near Venus so I am not sure of the question. There is no combined meaning. And yes the influence can be an affair or it may simply be an influence. The meaning changes according to the length of the line, whether it actually joins, or passes over it or runs parallel to it. Very often it does show a romantic influence. Such a line from Moon actually joining the fateline is not a very common sign. If such a line is found, I find it fairly accurate in its reading if one gets the age right. Thanks for your reply and sorry for the delayed revert. I got your first point that there's no combined meaning for any line joining from the mount of venus to fate line and at the same time line joining from the moon. About the last line I am a bit confused "I find it fairly accurate in its reading if one gets the age right." Fairly accurate in which aspect marriage or simple romantic influence. Thanks for your reply and sorry for the revert. I have got the first line that there's no combined meaning for any line joining from the mount of venus to fate line and any line joining from moon to fate. However, the last line I got confused where you said "If such a line is found, I find it fairly accurate in its reading if one gets the age right." What do you mean by fairly accurate is it marriage at that particular age or any romantic unison or influence at that time. Marriage is a legal document and is never reflected on the hand. However romantic influences can be seen depending on how strong the influence is. However these are not necessarily seen from the influence lines from the Moon mount. Lines joining the fate line from the moon mount invariably (100%) of the time show some type of influence. But like I said "...the influence can be an affair or it may simply be an influence...very often it does show a romantic influence". I am sorry I cannot be clearer than that. 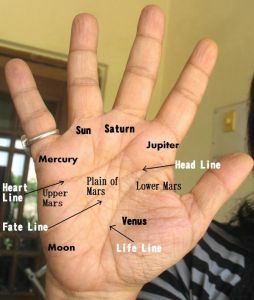 Hi nita, why do you think the heart line starts (timeline) under the Jupiter mount or anywhere on the upper section of hand why not under mercury ? isn't it logical to assume that a line is strongest at the starting point and gradually weakens as we age,as you may already know the heart line has its strongest roots below mercury and gradually weakens towards the jupiter or saturn mount. karthick, the Heartline starts under Mercury. I don't know why you thought that I believed otherwise. If there has been a mistake in any of my posts please let me know because sometimes there can be a typo. When I read hands and age on the Heartline, I take the beginning of the Heartline under the Mount of Mercury.